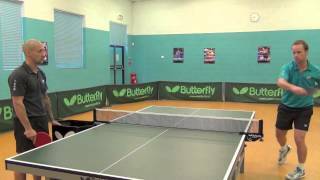 Here at Home Leisure Direct we have a fantastic set of video tutorials for Table Tennis. We have created a range of videos to show you all the tips and tricks you'll need to get you playing at the top of your game in no time. To talk through the game from basics to expert techniques, we called on Ryan Jenkins, Gold Medal winner at the Commonwealth Games, to help us record video tips and training to improve your game from the very beginning. To get started, we recommend our videos on The Stance and The Grip; these will get you started correctly and prevent the formation of bad habits. Ryan talks through every point of the game and explains why each is important, and these videos will prove helpful to more advanced players as well as novices. Once you've mastered the basics, Ryan can show you important techniques such as hitting the ball with the sweet spot on the bat, serving and the correct way to play both forehand and backhand shots. When you're ready for more advanced tutorials, we also have videos covering particular types of shot, such as top spin, back spin and side spin, as well as aspects of the game like returning a serve and smashing. 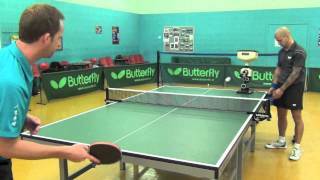 For an overview of the game, we have videos that explain how to score correctly and how to get involved in table tennis in your area. This comprehensive guide to Table Tennis will improve the match standard of any player. We even include a video profile of Ryan himself, if you'd like to know more about him as a player and how he has become so successful. If you're looking for a table tennis table on which to practise your newly-developed skills, we have a huge range and can advise you fully. Our award-winning team have a wealth of experience and really know their stuff when it comes to both indoor and outdoor tables. With years of experience, we can hold your hand as much or as little as you like. If you are concerned about your space, size of the table or whether or not a table will fit in your space, then you can either download any of our “Will It Fit?” guides or call the team who will happily help you over the phone. Of course, the very best option is to visit our Showroom to see our incredible range, try them out for yourself and talk to our expert staff in person. We believe visiting us will be the most fun showroom visit you will ever have. Whether you're looking for a table tennis table, table tennis accessories or one of our other fantastic games room products, we look forward to welcoming you soon with a freshly brewed cup of coffee and a truly enjoyable experience. Take our Showroom Tour to see what awaits you. Have Serious Fun improving your table tennis game. If you need any help with playing table tennis, purchasing a table tennis table or one of our other services, please call us on 01454 413636 or 0800 622 6464, or you can email us sales@homeleisuredirect.com, or why not visit our amazing showrooms - here's How to Find Us. How to Play Table Tennis: Ryan Jenkins Profile Ryan Jenkins, Commonwealth Gold Medalist, talks us through his achievements. How to Play Table Tennis: The Grip Ryan explains how to grip a table tennis bat properly. How to Play Table Tennis: The Stance Ryan explains how to perfect the right stance for different shots. 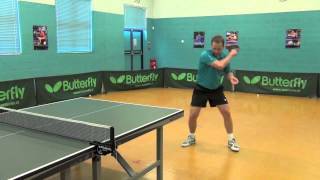 How to Play Table Tennis: The Forehand Ryan explains how to play a forehand shot effectively. 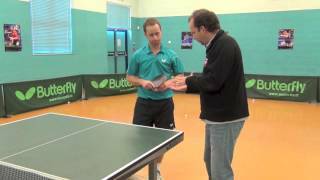 How to Play Table Tennis: Topspin Forehand Ryan explains how to play the topspin forehand shot. How to Play Table Tennis: Forehand Block Ryan explains how to play the forehand block shot. 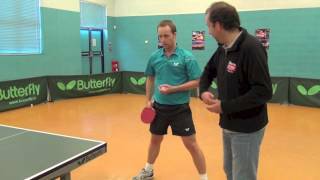 How to Play Table Tennis: Backspin Forehand Ryan explains how to play the backspin forehand shot. How to Play Table Tennis: The Backhand Ryan explains how to play the backhand shot. 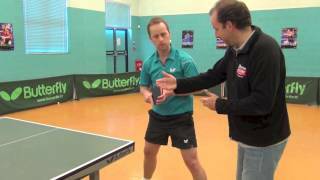 How to Play Table Tennis: Topspin Backhand Ryan explains how to play the topspin backhand shot. 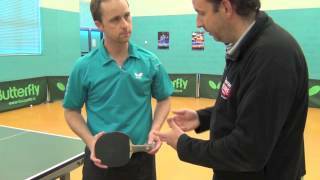 How to Play Table Tennis: The Sweet Spot Ryan explains how where the sweet spot is on the bat. How to Play Table Tennis: Backhand Block Ryan explains how to play the backhand block shot. How to Play Table Tennis: Backspin Backhand Ryan explains how to play the backspin backhand shot. How to Play Table Tennis: The Serve Ryan explains how to serve properly. 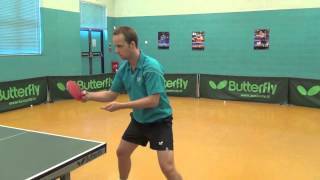 How to Play Table Tennis: Topspin Serve Ryan explains how to play the topspin serve effectively. 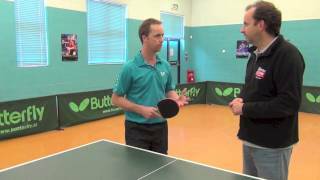 How to Play Table Tennis: Backspin Serve Ryan explains how to play the backspin serve properly. How to Play Table Tennis: Sidespin Serve Ryan explains how to play the sidespin serve. 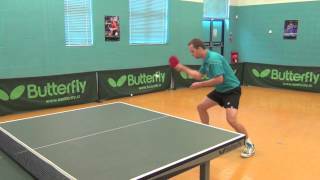 How to Play Table Tennis: Returning Serve Ryan explains how to return serve effectively. How to Play Table Tennis: Scoring a Match Ryan explains how to score a match properly. How to Play Table Tennis: Choosing a Bat Ryan explains how to choose the right bat for your standard. How to Play Table Tennis: Using a Practice Robot Ryan explains how to use a practice robot to perfect your game. 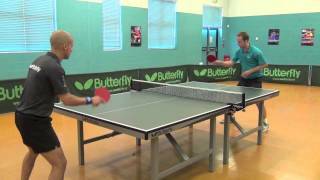 How to Play Table Tennis: The Smash Ryan explains how to play the smash shot effectively. How to Play Table Tennis: How to get involved Ryan explains how to get involved in playing the game.